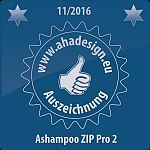 Become a file compression expert with Ashampoo ZIP Pro 2! Powerful ZIPX format support - supports all ZIPX formats: LZMA, JPEG, PPMd, BZIP2, XZ and WAVPACK. Batch Archive Tool - Automatically create multiple archives from individual files. Multi Extract Tool - Extract multiple archives at once. Archive Converter Tool - Convert multiple archives from one type to another. Powerful skinning system with 5 different skins included. Upload files to Dropbox, Google Drive, One Drive, Amazon S3, Azure and Box online services. FIPS 140-2 validated encryption components. Volume Shadow Copy (VSS) – With VSS, you can backup any file/database on the computer, without closing program using it. UAC elevation support – supports UAC (user access control) elevation to administrator when it detects the need for admin account in order to read or write in some folder. Better integration with WinRAR if installed. Beautiful graphical interface, very intuitive and easy to use. Full integration with Windows 7, 8 and 10, as well as Windows Server editions. Powerful integration with Windows Explorer Shell, both 32bit and 64bit. Supports creating and extracting ZIP, 7-ZIP, CAB, TAR (TAR, TAR.GZ, TAR.BZ2, TAR.XZ) and LHA formats. Supports extracting from over 30 different formats, including RAR, ZIPX, ARJ, ARC, ACE, MSI, NSIS, CHM, DMG, RPM, CPIO, VHD, XAR, LZMA, LZH, SquashFS, CramFS, Z, ZOO, WIM plus ISO (ISO9660 and UDF). Great support for all versions of RAR format, including latest 5.x. Virtually unlimited size of the archive, unlimited size of files inside archive and unlimited number of files inside archive when using ZIP and 7-ZIP formats. Repair ZIP Tool - Repair broken ZIP files. SFX Wizard - Create powerful SFX - Self Extracting Archives. Write Multivolume ZIP - Split existing ZIP files into multiple volumes. Encrypt and Decrypt multiple files at once into several different formats: ZIP, ZIPX, 7-ZIP, PAE, PAE2 and OpenPGP. ZIP/ZIPX AES 256 Encryption/Decryption – Full support for industry standard – ZIP/ZIPX AES 256 bit Encryption, fully compatible with open data standards and all of the major compression utilities. Encrypt/Decrypt/Sign/Verify files with OpenPGP standard – Create and Open encrypted OpenPGP files with various different Encryption options. Fully featured! FIPS 140-2 validated – Encryption Suite uses FIPS 140-2 validated components for AES encryption. Support for PAE and 7-zip formats – Full support for PAE, PAE2 and 7-zip AES encryption formats. Password Profiles – Predefine your passwords and use them conveniently. Quick and convenient way to install software and games. Copy Disc to ISO Tool - save your existing discs to ISO images for use with Virtual Drive. Powerful Scripting support for creating different backup tasks. Secure FTP/FTP/Cloud uploads – Upload backups to FTP/SFTP/TLS server, FIPS 140.2 validated as well support for 6 different cloud services (Dropbox, Google Drive, One Drive, Amazon S3, Azure and Box). Compression options- Use advanced 7zip compression to minimize backup size, or chose between other possible formats such as ZIP, ZIPX, TAR, CAB, etc. Connect to Dropbox, Google Drive, One Drive, Amazon S3, Azure and Box online storages. No need to install their services. Download/Upload/Rename/Delete through simple and quick Cloud browser.